A fatal paradox strikes Bundelkhand in the face—an overflowing wheat stock yet an overwhelming number of farmer suicides. Farmers here dread the government wheat procurement centre and the post-mortem house. In Orai, a small town in the Bundelkhand region of Uttar Pradesh, the two are separated by just a few yards. “For a farmer, this distance is between life and death,” says Krishna Yadav, a farmer. Like most farmers of the region, Yadav has been waiting in front of the wheat procurement centre for the past one week with his three tonnes of wheat loaded in a rented tractor. But the government is not buying it. “We do not have gunny bags to store wheat,” says Malkan Singh, an official at the centre. The statement is nothing less than a death sentence for Yadav. He cannot wait any longer. Rent for the tractor is becoming unaffordable. “Nobody knows when the gunny bags will arrive. I will have to sell my produce to private traders who will give me Rs 900 for a quintal (0.1 tonne) instead of Rs 1,285, the government price,” he says. He already has a debt of Rs 50,000 accumulated since 2007 when a severe drought hit the district. If Yadav does not get the government price for his wheat, he may soon step into a debt trap that could finally lead to the post-mortem house, as many farmers have found. Kalicharan Kushwa’s elder brother committed suicide on June 14. 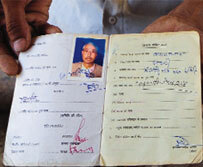 “He took loan of Rs 25,000 on his Kisan Credit Card but could not repay it. He had sold wheat to private traders at throwaway prices,” says Kushwa of Kabilpura village as he waits outside the post-mortem house to collect his brother’s body. Orai has reported eight such cases in the past two months. Similar suicide cases have been reported from Mahoba, Lalitpur and Hamirpur districts in Bundelkhand. The region received more than normal monsoon last year. The crop was also good. Uttar Pradesh recorded a bumper 31.5 million tonnes of wheat crop this year. According to agriculture officials, Bundelkhand has taken over Punjab in per acreage wheat production, particularly in Mahoba, Hamirpur and Jhansi. The state’s procurement of wheat records 144 per cent increase this year—from 1.64 million tonnes in 2011 to four million tonnes in 2012. The government procures only a part of the total wheat production. But it is a critical cash income for the region’s small and marginal farmers. The minimum support price that the government has fixed is much higher than the market price. This should have come as good news for the debt-ridden farmers crawling out of a six-year-long drought. Crop failures were also due to extreme winter and rising input costs like wage and diesel which had pushed farmers to a debt abyss. The total outstanding rural bank debt in Bundelkhand is Rs 4,370 crore. According to government surveys, 70 per cent of the farmers in the state are in debt. The bumper crop this year has not helped farmers much. As procurement picks up, more and more suicides are reported. During May-June, 15 farmers committed suicide in the region. Since January this year more than 80 farmer suicides have been reported that have clear links to debt. In 2011, another year of abundant production, there were 519 farmer suicides in the region. Procurement has stopped in all the districts of Bundelkhand since June 10. Non-availability of gunny bags is just an excuse, say farmers. They see a nexus between government officials and private traders. “Officials at the centre delay procurement so that farmers are forced to sell wheat to private traders at a low price. The traders then sell the same wheat to the government agency at the minimum support price, which is higher,” says Lalluram Niranjan, leader of Garhar village in Orai. “It is an induced distress sale,” says Sanjay Singh, a social worker. Fifty-year-old Jasoda Bai is worried because the rains are around. 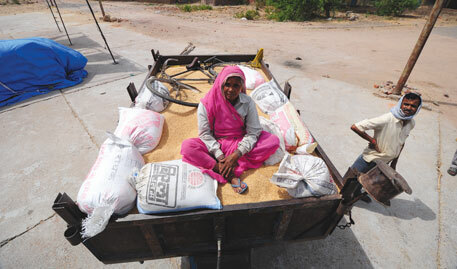 She has hired a tractor to get two tonnes of wheat to the procurement centre at Mahoba. “I am not sure when the government will start buying. What can I do?” Her sure way of getting something out of her harvest is to sell it to private traders who have shops metres away. Such is the delay at procurement centres that in Lalitpur district many villages have decided not to take their wheat to government at all. They will sell it directly to private traders albeit at a low price. “At least we will not waste money in hiring tractors,” says Sarman Banskar, panchayat head of Budawani village in the district. On June 30, government will officially stop procuring wheat. From then will start farmers’ long wait for the next year’s harvest. Unlike the rest of the country, Bundelkhand predominantly grows crops during winters. As monsoon sets in, farmers leave the land fallow for cattle to graze upon. This is an old system called annapratha which does not allow farmers to grow crop during summers. “The rural agricultural credit system has a large role to play in suicides. When banks and financial institutions initiate loan recovery processes, farmers face the threat of losing their possessions and social esteem,” says A K Verma, who teaches at Christ Church College in Kanpur and has researched farmer suicides in the region. “Earlier, we had hopes that we would be able to fight a bad tide. But not any more. We don’t get support from anywhere,” says Tejuwa Sahoo whose 65-year-old father committed suicide on June 14. Returning from the funeral, he shows his father’s Kisan Credit Card, which, he says, is the reason behind his father’s death. “Government mortgaged our land. My father was scared that it would go,” he says. Government’s Kisan Credit Card gives a farmer access to credit. Most of the debt traps would have been avoided had banks adhered to the Reserve Bank of India’s directive on Kisan Credit Card. It exempts farmers from mortgaging land on loans up to Rs 1 lakh, and permits loan recovery in installments in 10 years. Most of the farmers have taken loans between Rs 25,000 and Rs 80,000. Farmers prefer to repay private lenders first because they harass a lot and their interest rates are high. This year, keeping in mind the high production of wheat, public sector banks have also become aggressive in recovering loans and are threatening to take over mortgaged land. “Fearing loss of their only asset, farmers prefer to commit suicide. It frees their land from the government,” says Niranjan. This is a closest realistic analysis of woes of farmers in bundelkhand. I have recently left corporate life and started doing farming in Tikamgarh, mp. When I came in may, I could see huge crowd making temporary shelters on their tractors or heap of wheat waiting outside purchasing centers. The mighty got their grain already fed in procurement system through back door without even sending wheat to center. 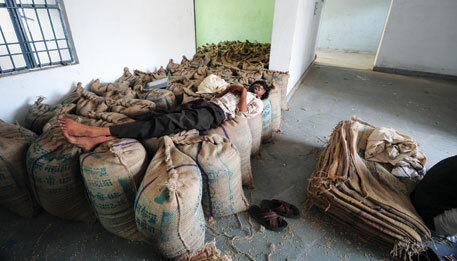 When whole procurement process got completed, this grain was sent to warehouses in mid of the night. While govt, towards the end of procurement deadline, announced purchasing of gunny bags from farmers also, procurement systems were already full with black market grain. A vicious nexus of govt employees, business men and middle men have turned this long awaited bumper production into a failed affair. I do not understand why govt stop purchasing grain from the last farmer. We all know that the weakest farmer is the last farmer to produce document and sell grain. Why doesnt govt digitize land records on priority basis to minimize corruption? Bundelkhand needs new approach for solving it's problems. Hope govt is listening. How sad the state of farmers is in our country....a country where farming is one of the main sources of bread n butter for most! N how sad n alarming it is to see how much corruption has ruined us!!! Whatever may be the situation overproduction or underproduction,both way farmer's are going to suffer.problem is not providing credit,problem is no efficient credit reporting system.Financial institutions and bank should readily check the farmer's debt history and then avail loan to them. Pathetic !!! and what to say to procurement and warehousing facility of govt.,they just dnt have gunny bages?? ?unable to understand.I think now farmer's will scare in over-production conditions too.Anyway,,farmer's are suffering...high time to do sometinhg!! !